Consumers today have enormous power to communicate what they want, when and how they want it. They demand real-time conversation and a two-way dialogue that marketers try to meet by providing them with fresh and relevant information they’d love to consume anytime. Question is – how can you produce this type of dialogue consistently? In order to produce a wide range of valuable content regularly, everyone in the organization should be encouraged to contribute to content creation. Highlight the core competencies of employees by allowing them to become subject matter experts. Let them showcase their skills, proficiency, and capabilities. Fuel their excitement to contribute and showcase their knowledge. Set aside the notion that only writers can write (or that writing is the majority of the type of content you should be publishing). Everyone in the organization must adopt the content marketing mindset. Change can be intimidating. Companies of all scale may, at first, resist this transformative concept. So how do you start implementing such a shift in a current content strategy? How do we get everyone to participate in creating content? The answer is…Start from the top down. Such a change requires a top down executive buy-in and support. Below are some strategies. Ideally, enforcing changes in company culture must begin with the top management. If you want to encourage everyone in the organization to blog, then be the first to show that you can make time for it. As Gandhi once put it, “Be the change you want to see”. Let me cite an example. One of our clients, who we can’t name for confidentiality reasons, launched their website two years ago and decided to create a company blog. But it seemed like there were always more important things to do than keep their posts updated. The marketing director would write articles whenever there was time or when there was big news about their industry that just couldn’t be ignored. Overall, it was dry and unexciting. A year since its inception, they sought our help and together we finally sat down on it. This client realized that they want to make the most of this medium, they just don’t know where to start. I suggested that primarily, their blog should strongly mirror their expertise to prospective clients. As we drafted the process, I suggested that the marketing director of the company should be the first to make a commitment to update it every single day. And she did. If a leader can make time for it, so should everyone. Part of the company’s strategy is that only one person will become the face of the brand. In their case, it was the marketing director since she’s the one who meets clients and closes deals with them. Thus, it was agreed that she will solely represent/author the company blog posts. But to make the blog creation more efficient, we delegated more people to monitor its performance, track how many visitors are reading each post, and identify which topics are closest to the heart of their readers. These steps alone have enabled the brand to get the pulse of their market right away. Creating a content culture is such an amazing way to promote transparency. It gives people a preview of their competencies as an organization and a glimpse of how knowledgeable they are with the latest industry updates. Adopting a culture of content makes permission marketing possible. In the words of marketing guru Seth Godin, it provides you the power to turn strangers into friends, and friends into customers. It gives your company the privilege to deliver anticipated, personal, and relevant messages to people who actually want to get them. Content creation also amplifies your lead nurturing process. In the case of this company, regularly updating their blog posts resulted to a dramatic increase in the number of their followers. Their page views increased as well as the average time visitors spend on the site. Presently, the company is enjoying the surge in their blog followers. It continues to open new opportunities for them such as speaking engagements and invitations for conferences. It’s what earns them now the credibility, following, and recognition most companies their size are still aiming for. Here at TrueLogic, we decided to create a different strategy. Instead of having just one person represent the blog, we invited all our employees to write posts for it. Last month, we rolled out the changes that need to be made, and officially invited everyone to take part in content creation. While most were excited, some expressed their concerns about not having enough time to write. Welcome these obstacles. Constraints fuel creativity. In the face of limitations, we’re compelled to entertain new perspectives we never would’ve considered had we not encountered such restrictions. Explain to employees the possibilities of embracing a content culture. To encourage everyone to participate, we tried to make them appreciate its value by presenting the benefits they could get for contributing. We explained that it gives everyone a fair chance to showcase their expertise, may it be in web design, web development, SEO, client servicing, social media , or IT. Every content piece they post can even be added to their portfolio as they progress and build their careers within the company. They can also network with more people if their article gets shared to a larger audience. We then assembled a “content marketing governance board” composed of representatives from each department. They’re responsible for coming up with at least one article from their team. We set a meeting every week to finalize actionable ideas, which we compile in our publishing calendar. There’s no need to worry about the format, we just want them to share their ideas and professional points-of-view about relevant issues that are important to them. We’ve just started, but we’re already receiving positive feedback from different teams. 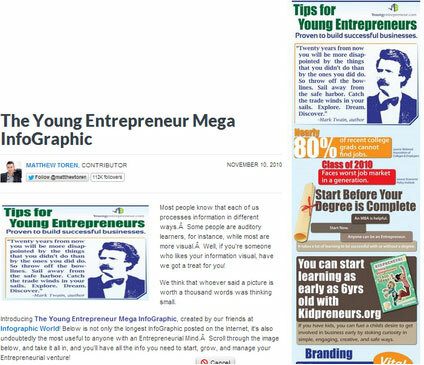 We plan to use a variety of formats like infographics, videos, and a lot more. We’re starting with the company blog and hope to extend this effort to the rest of our social media strategy, and we can’t wait to see how this will play out for the better. To demonstrate another facet of a successful content culture, let’s take the case of Marketo. Marketo’s blog entries are a wide-range of things. The blog features several different authors who discuss best practices, new ideas, and latest trends in Marketing Automation. It offers an assortment of knowledge, insights, and information in areas such as content, social, and event marketing, lead generation and nurturing, automation, and a lot more stuff. With Marketo, having different subject matter experts enables the blog to expand its readership and engage more people across different fields. The variety of writers translates to different writing formats that eliminate the risk of readers getting bored with a monotonous writing style. More authors mean more brains to pick for incredible ideas. Because there are more selection of contributors, these writers have ample time to set their pace and think of a fresh topic to share with their followers. By showcasing different employees who are passionate and knowledgeable about their craft, Marketo is able to cement its thought leadership in Marketing Automation. It sends off the message, “Hey, we’re a bunch of thought leaders here. Come join us.” without really having to say it. And so far, they’re doing a great job. Let’s say you’ve already convinced your employees to participate in content creation. The next question is – how do you create a post that attracts more clicks, conversions, and builds a steady stream of followers? 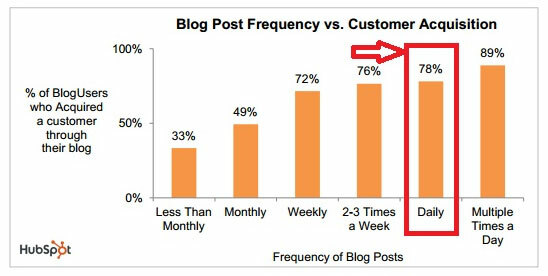 Some blogs always get more traffic than others, are more engaging, and attract lots of readers. So here, I list down a few things that can help you create an effective blog that compels your audience to interact and take action, and ultimately drives conversions fast. Choose relevant topics.Feed your readers with educational, high-value topics. How do you do that? KNOW YOUR AUDIENCE. If you know exactly who your readers are, their demographics, and so on, it will be easier for you to choose a subject that offers information that’s of interest to them.One of the things we noticed when we reviewed the performance of our client’s blog is that the articles that drove the most conversions are how-to educational posts that are useful to their audience. Their readers, who are mostly agencies and resellers, are willing to spend up to 20 minutes per post whenever the topic talks about SEO reselling as compared to posts that mainly update them on latest news in the SEO industry. Be persuasive. Powerful and highly effective blogs influence readers to take a stand, comment, or make their opinions count on the issue/topic presented by the author. They may or may not agree entirely on the ideas presented but an effective blog should be able to generate a healthy interaction between author and readers. Leave a comment section. This will encourage dialogue among your audience. Use a strong title/header. A good rule of thumb is to keep your title under ten words. 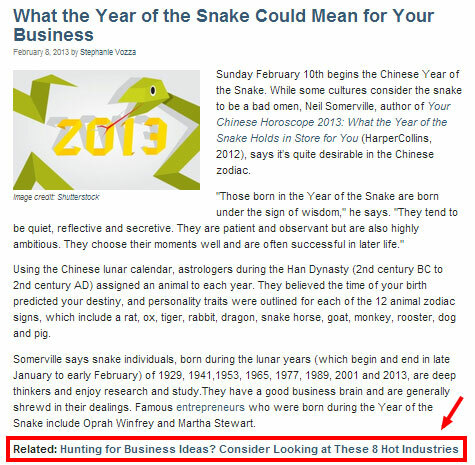 It should be simple yet catchy enough to capture attention and provide readers an idea on what your article is about. Ensure layout is clear and skimmable. Many people don’t read blogs from start to finish. Make your key points stand out by using subheads, short and concise paragraphs, bold-faced text, or whatever you think will help catch a reader’s attention. Link internally. Once you’ve gathered enough posts, make sure to link back to past articles you’ve written. This helps improve your site’s average page visits and your reader’s time-on-site. Use credible external sources. If you need to use information or data from other web sources, acknowledge them by including their links. 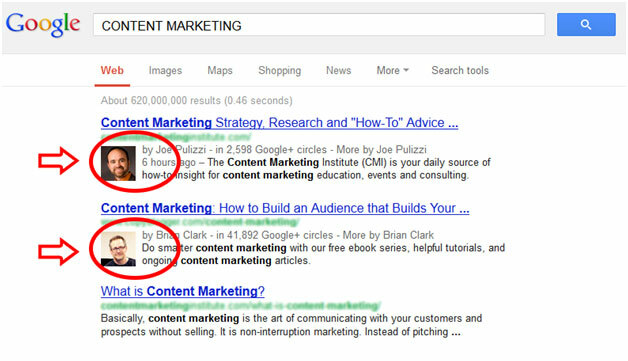 This is also good practice to increase your credibility among search engines. Create an authorship markup. With so many content scrapers these days, Google launched the Authorship Markup so that real authors may claim credit for their work once it’s posted online. It allows you to link the post you’ve written to your Google+ page and to attribute your name and profile link to the piece. 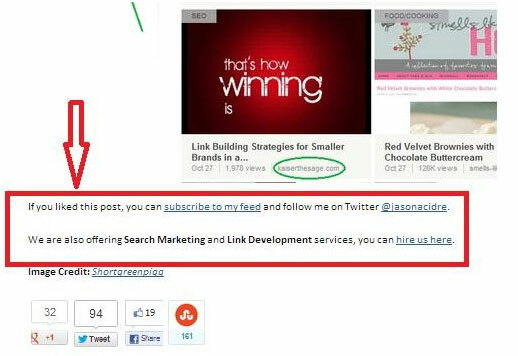 Google then displays selected portions of that work in search results with a link to your Google+ page.Having an authorship markup helps put you on top of the search rankings compared to competitors who may have written about similar topics but don’t have a markup. Improve shareability. It’s important to keep posting valuable content in order for it to be share-worthy. 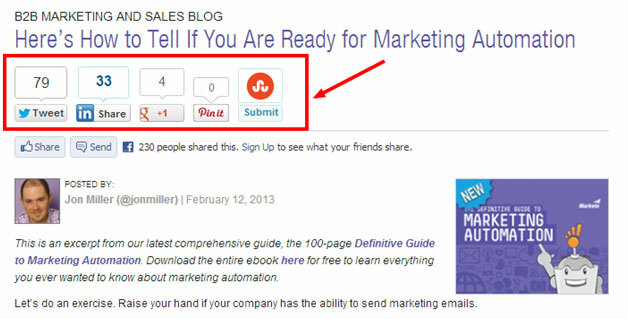 Make your social sharing buttons visible in every post. 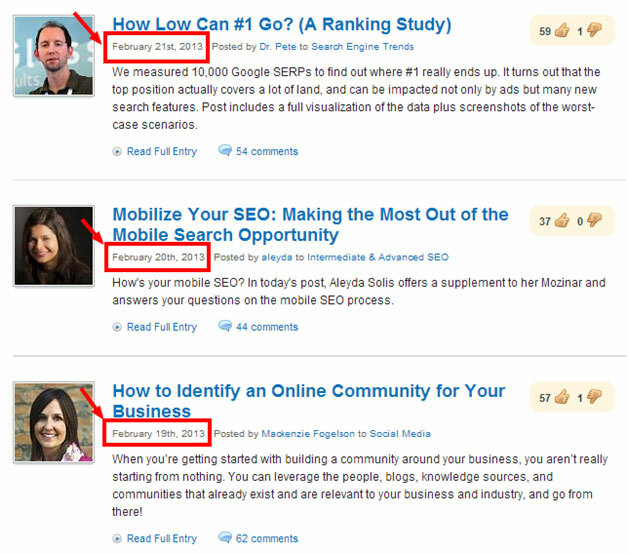 Effective bloggers position these buttons either above the fold or at the end of the content. Source: Marketo.comWe advised our client to share a link of their blog posts on their social networking accounts to increase readership. Just look at the table below and see the number of unique visitors they get per month by simply sharing their posts on these social sites. Provide fresh updates regularly. If you can, try to provide new updates on a daily basis.According to Hubspot, companies that blog 20 or more times in a month see the most return in traffic and leads. The next two graphs show a comparison of the number of unique visitors to our client’s blog before (June 2011 to Feb 2012) and after (June 2012 to Feb 2013) they made an effort to update it regularly. 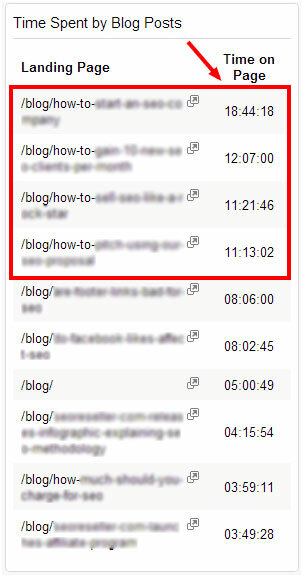 Notice the spikes that indicate the big difference that consistent blog updates could make. Encourage interaction. Encourage participation from your readers. It’s common practice these days to end blog posts with a one-liner question to stimulate readers to share their comments, feedback, and suggestions. Optimize rich media. People learn better through pictures. Research at 3M Corporation concluded that we process visuals 60,000 times faster than text.So always consider using charts, graphs, infographics, videos and diagrams, and scintillating images on your posts to make it look attractive and interesting to your readers. If you can come up with your own company-branded visuals, that’s more advisable. But if you must borrow images, make sure to give due credit the owner. Optimize call-to-actions. Write with a purpose. Present the information in a manner that will compel your readers to do something right away. 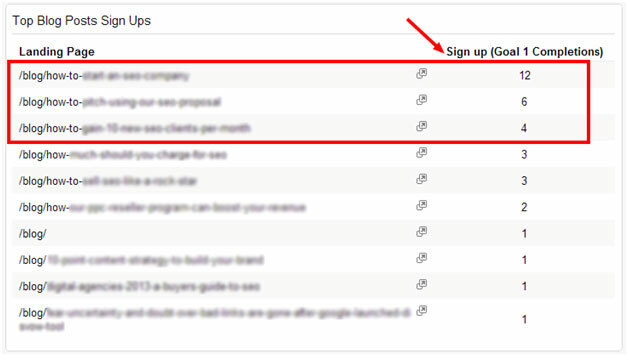 Include call-to-action buttons to generate more leads. Invite them to sign up to your newsletter or white papers, subscribe to your blog feeds, or follow you in social networks. Maintain a weekly KPI report. Monitoring your weekly performance helps you make informed decisions on changes that need to be made in your blog posts. It’s good to note that if you’re managing multiple writers, an editorial/publishing calendar is a necessity. It helps you create a timeline of content deliverables, while at the same time keeping everyone up to date with their post schedules. To optimize efficiency, I recommend that you use Google Docs. There’s no need to download and install any software to use this web-based application. You can easily access it as long as you have a computer and an internet connection. Google Docs allows users to create work documents simultaneously online. Multiple users can even edit the same file at the same time. Such online collaboration helps you streamline processes in a most time efficient manner. 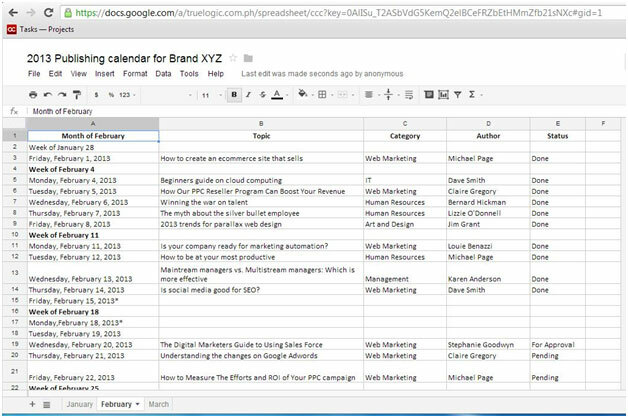 By having an updated publishing calendar, you free yourself the burden of coming up with a topic every single day. It helps you avoid missing out on deadlines. Plus, everyone in the organization knows what topics are scheduled for a given week or month. 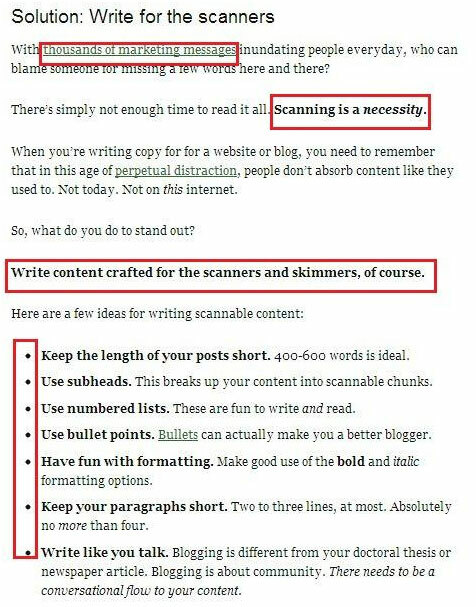 This helps people prepare their content in advanced if they can. After we’ve gone through the steps on how to adopt a content marketing culture and after enumerating tips on how to make a successful blog, you’re probably excited to get started and see how this effort will benefit your target audience. But here’s the bottomline of it all. On top of satisfying customers, integrating content into your company culture fosters a supportive environment where employees are free to share their ideas. It gives them a platform to address their basic need to be heard and to step up – it serves as a validation that the contribution they make to the organization matters. According to Vineet Nayar, author of acclaimed book ‘Employees first, customers second”, it’s crucial to empower employees to lead in order to drive productivity and push the organization forward. A company that says “customer first”, he said, does not really know how to deliver such promise. Before we work on the communication equation between companies and consumers, we must fulfill the needs of the people who help keep our companies thrive. When employees aspire to make their ideas count, it makes them more excited to improve themselves and keep learning. The more they know, the more they are able to share and contribute. It reflects on their jobs, the quality of their work, and it keeps them excited to keep on achieving a shared goal with the company. The employee grows, the company thrives, and it reflects on the quality of products, ideas, and services that customers enjoy. 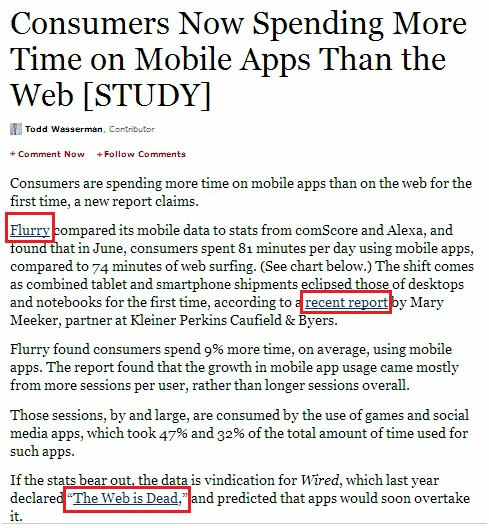 More so we, marketers, won’t have so much trouble producing relevant content to feed our data-driven audiences. In the end, it’s a win-win situation for everyone.